Our style of karate was developed by Dr. Tsuyoshi Chitose, a native of Okinawa who refined traditional fighting and training techniques to create an effective martial art which is based upon anatomy and physiology. This makes it less stressful on the joints of the students, enabling us to train and to enjoy karate for our entire lifetime! 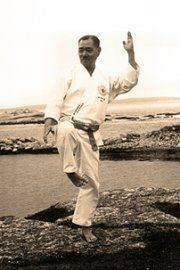 Dr Chitose became one of the pioneers of Japanese karate instruction and his traditions are being continued here in Canada by his student ( our Saiko Shihan ) Shane Y. Higashi 9th dan. Chito Ryu promotes strong flexible bodies, disciplined minds and lifelong friendships among its practitioners. Techniques of Chito Ryu Karate-do include punches, kicks, strikes, blocks, evasions, throws, chokes, joint locks and traditional weapons training. There is something here for everyone from six to ninety-six! Contact us or stop by to say 'hello' and try a class! You are always welcome. O-sensei Dr. Chitose practicing in his 70's.